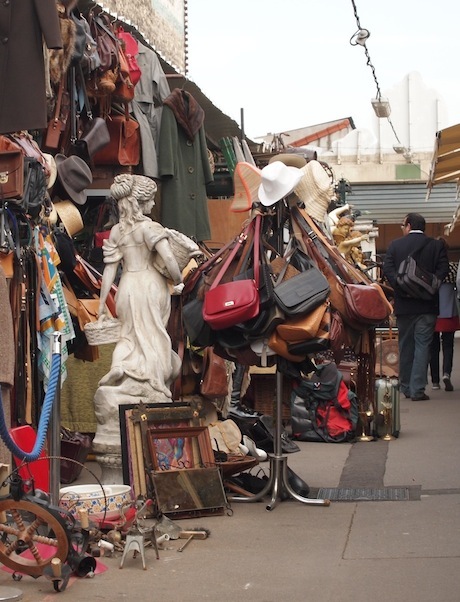 There’s just no place like the marché aux puces, aka the Paris flea markets, especially at Clignancourt, the largest Paris market and one of the best shopping resources in the world. Strolling the markets is the perfect way to spend an afternoon, cutting through little streets and alleys, admiring the curated collections dealers have laid out. But there’s another side to the market that most people don’t get to see, one that’s not as picture perfect but where dealers themselves shop and trade with each other. 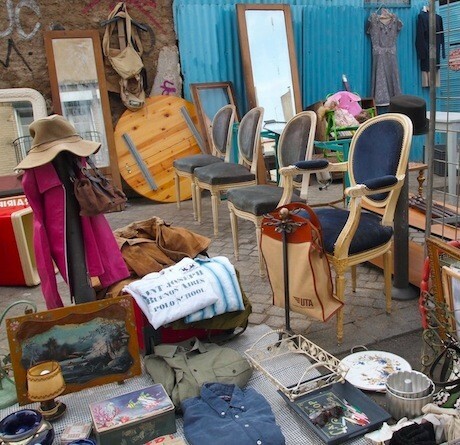 The Paris flea markets and the vendors who manage them have long been a staple of the landscape in the city. For me they’re the heart and soul, the dealers quietly and reliably setting up whether rain or shine, every weekend for over 100 years. 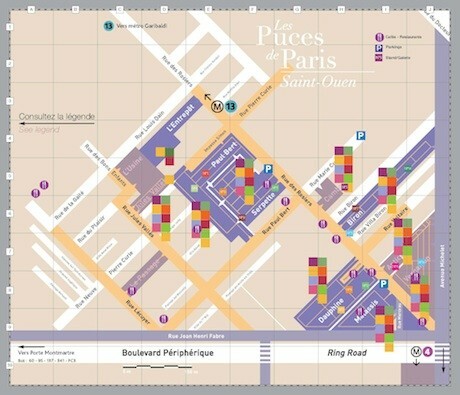 In Paris the markets are a treasured tradition and being a vendor is a respected profession. Some believe that the markets have been poached, even pillaged! They’ll say that there are no bargains left, and that Clignancourt (aka St.-Ouen) is a tourist trap. After decades of exploration and bargain hunting, I still find nothing to be further from the truth. These markets are filled with authentic, affordable, one-of-a-kind finds, but the fact is, you have to know the lay of the land. And if you’re willing to go off the beaten path, you’ll find exactly what you’re looking for. At a bon prix at that! The first thing to learn about Clignancourt is how it’s laid out. The market itself has two entrances, and both are off the rue des Rosiers, one from each end. Most people use the No. 4 line and get out at Porte de Clignancourt. This will take you in through all the new items, and it can get dicey. The alternative is to use the No. 13 line and get off at Garibaldi, walking a few quiet blocks until you get to the rue des Rosiers from the other end. Either way, it’s off this street that all the magic happens. The entire setup is like a small city consisting of about 14 submarkets, indoors and out, upstairs and down, in alleys, passages, shops and warehouses. Each is either on Rosiers or a street shooting off it. Some streets go two or three blocks deep into the market. Of course the deeper you go, the less pretty it is, but that’s where a lot of the treasure hunting happens. Clignancourt itself is open for a half day in the morning on Fridays. (It’s a dealer’s day, with a lot of trading and selling at L’Usine. If you’re a dealer or shopping professionally, it’s a great place to check out. Bring a business card to get in and look around, and keep a low profile.) On Saturdays and Sundays, most stalls are open from 8 a.m. to 6 p.m. On Mondays, dealers come once again, and shoppers can meet vendors with an appointment. Many of the dealers come in for a half day, from about 11 to 4. 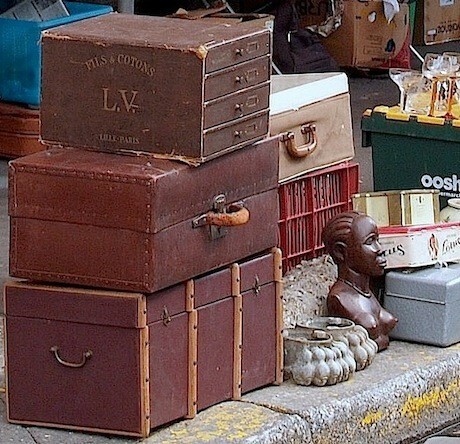 Popular markets like Vernaison and Serpette are fabulous and have loads of atmosphere, but if you’re shopping to take home real bargains, head along the rue des Rosiers to the end of the rue Paul Bert. Most people stop here and turn around. But if you go a little further, you won’t be disappointed. Dealers buy and trade back here, and haggling is de rigueur. It’s absolutely no frills, but you’ll find what you’re looking for. Almost. We have to go a little deeper! At the crossroad here, make a left onto the rue Jules Vallès. 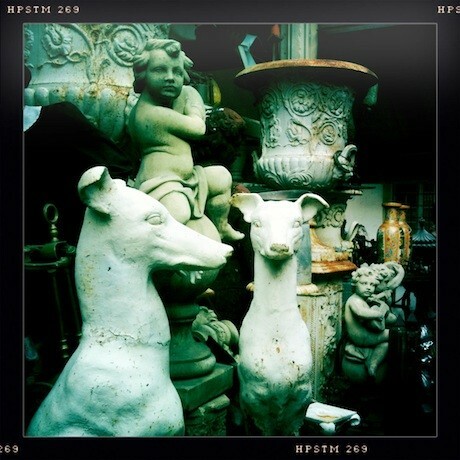 You’ll see fewer decorative booths and more wares set up on the streets. Chances are you’ll also hear a Victrola playing and lots of laughter. About halfway down the street on the left will be the Passage. This is a fascinating bridge between the main market and the back end and is filled with vintage goodies. If you make it this far, you’ll have gone deeper than most, who just skim the surface. 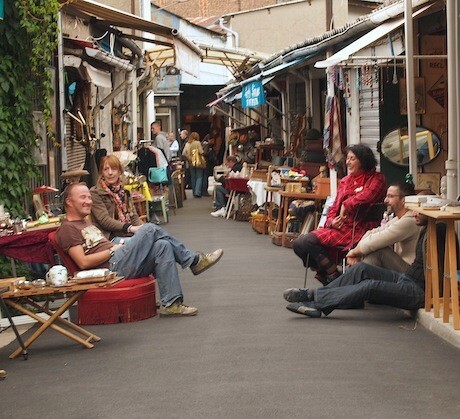 Once you go through the Passage, you’ll find another flea market along the rue Lécuyer, with vendors who are happy to negotiate and haggle. 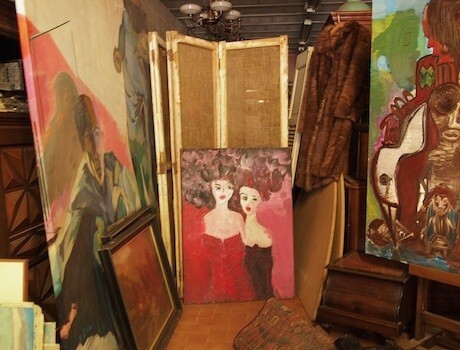 It’s loaded with everything from paintings to chandeliers to authentic French furnishings that haven’t been pedigreed yet. If you want to experience a bit of the underground, go off the rails and head back here to the authentic Paris we love so much. Don’t be afraid to dig under tables and in boxes, and to ask for deals when buying one or more items. 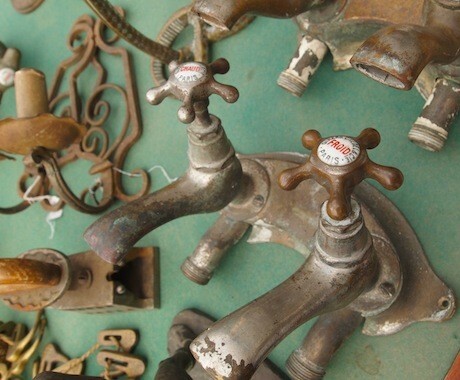 You’ll find the atmosphere playful and fun, a real flea market experience where you’re sure to find a one-of-a-kind treasure to keep forever.